Mordian 7th Regiment: Heresy Era Dark Angels - Vortigern's Pride Painted! Heresy Era Dark Angels - Vortigern's Pride Painted! Once the painting servitor completed the Iron Warriors I gave some thought into what would come next. More infantry, it turns out! I had gotten the greens down on the terminators a while back and rather than start something afresh I figured I ought to finish 'em off. After two near back-to-back 30-strong batches, painting a mere 11 minis was bliss! The terminator complement of the warhost is known as Vortigern's Pride, and consists of the inner circle of the force. At the end of the Heresy, they all stood aligned with Vortigern as he sided with the traitors. 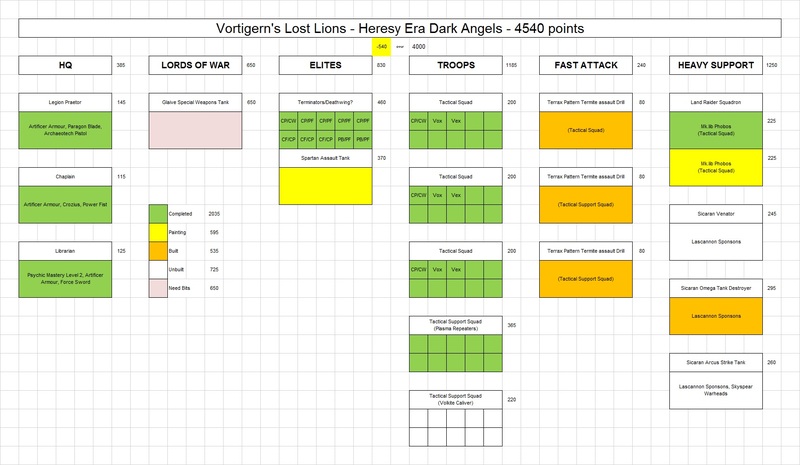 Though the Lost Lions warhost's activities during the Scouring and the Legion Wars can only be speculated upon, they appear in the chronicles of the Imperial Fists as sailing with the arch-traitor Abbadon at the outset of the First Black Crusade. Vortigern is shown here in Cataphractii warplate, bearing a Terranic Greatsword and a combi-plasma. 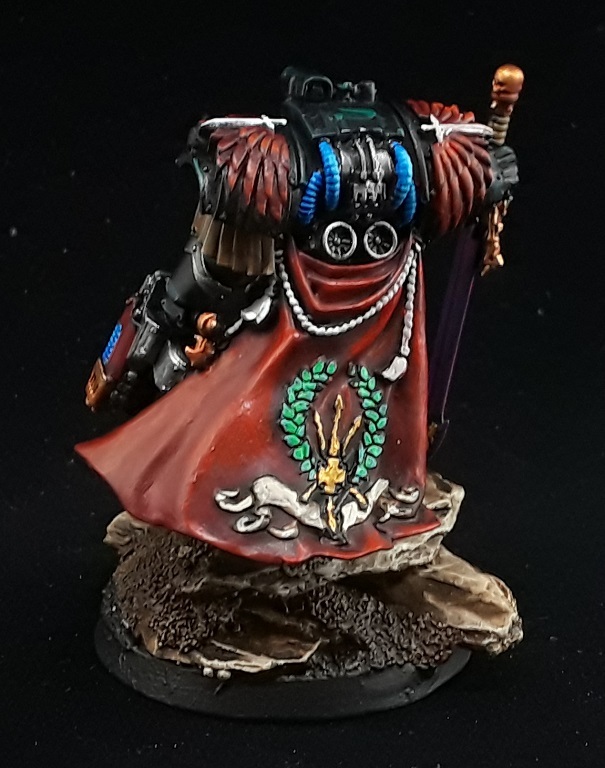 I was really pleased with how well the cloak fits the model - Definitely going to scavenge a few more for future projects! 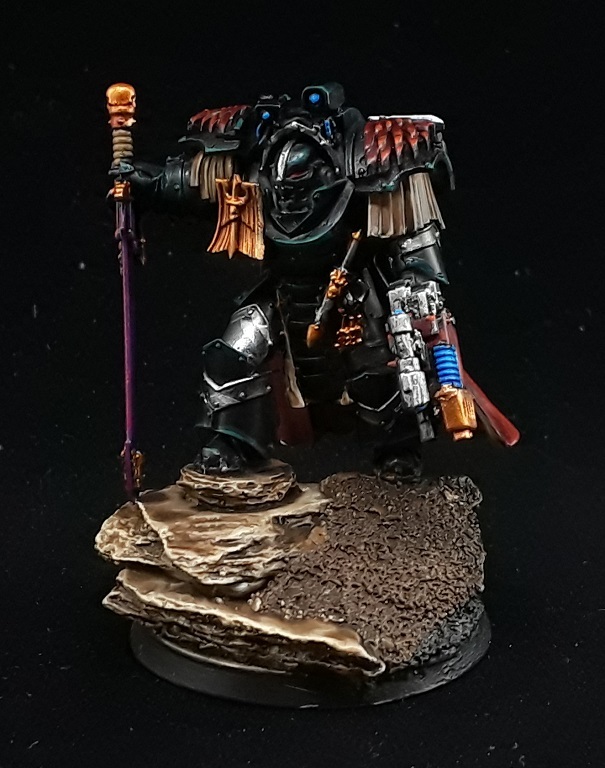 Vortigern's Pride is led by Brother Arvelan, accompanied here by the two specialists of the unit both bearing plasma blasters. 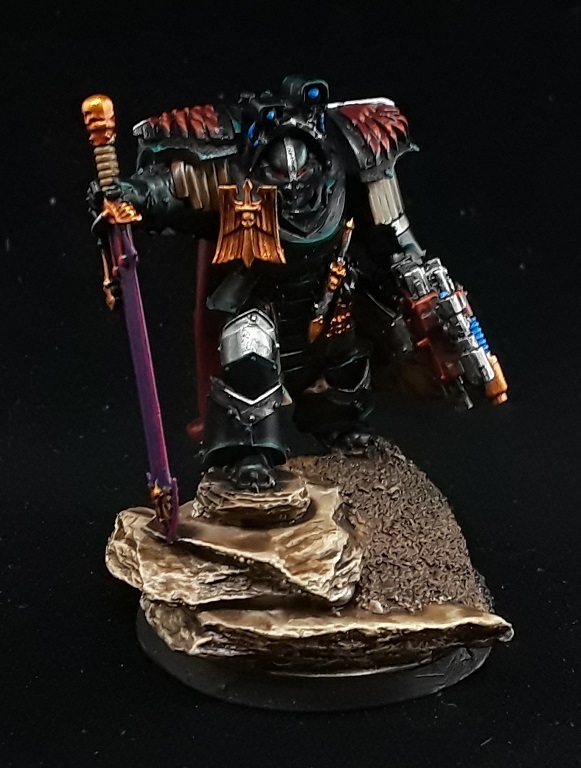 Arvelan wields a Calibanite Warblade and a combi-plasma. Starting to sense a theme here? My favorite thing about terminators is the chainfist! I think any self-respecting unit ought to have at least one. Vortigern's Pride features three - No plasma here though, just basic combi-bolters. Four more combi-plasmas round out the squad loadout, mostly out of a sense of symmetry. At 7 points each I needed to work five in total into the squad so it comes out as a nice 'even' 35 points. The painting chart is starting to get colorful now! Got a viable 2000 point army painted already which is a nice milestone. Well, viable as in "Conforms to the Age of Darkness FOC", not "This is an effective force". Hah! Cheers! They were quite fun to work on! Wow, these look like smashing traitors. Purple sword? Like the idea, but did you get the idea from somewhere? I do sometimes wonder if you really DO have a painting servitor!! Ooo very dark and moody. Love them! Nice to see a painting chart getting filled in, too! Thanks! 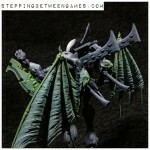 I'm reasonably pleased with the "green" black armour, it does make them look fairly menacing. Filling in the painting chart is one of the most satisfying parts of the process! They are looking well and glad they have a nice background to go with them. Thanks very much! It's been a fun project to work on so far! Heresy Era Dark Angels - Vigilator built!